Glen Beck Racist? You decide. Remember the days when Republicans used to protect constitutional freedoms. Some people think that PhD just means that you are finely done. What it actually means to get a doctorate is explained in pictures. In a dog's world change is bad! Sort of indicates how good their life is. The Carebear and company seem to be very annoyed that no one is giving them credit for their accomplishments. Unfortunately for them its pretty much impossible to prove that you avoided what didn't happen. 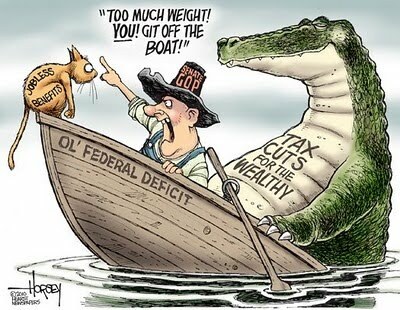 During my life time the biggest cause of Federal deficits has been tax cuts. It started with Reagan, and continues to this day. Is it any surprise that Clinton both raised taxes and reduced the deficit. Yet the Right has the delusion that tax breaks are somehow separate from the deficit. Its magic money that is automatically offset by an improved economy. And failing to extend the cuts, which even the Bush administration thought was unnecessary, will cause economic collapse. Unfortunately reality has never worked this way, not that the facts ever get in the way of a good sound bite. The Washington Post points out that letting the Bush tax cuts lapse will not cause the economy to collapse, but rather will impact a very small amount of the population. What is reality when paranoid delusions become the norm.